Happiness arises to help you look outward (or forward to the future) with hope and delight! 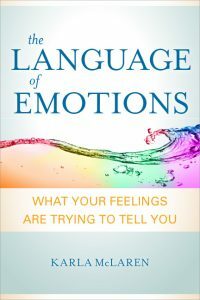 As I’ve been posting about the emotions one by one, you may have noticed that when I talk about emotions, I almost never start with the happiness-based emotions. It’s not that I don’t like happiness; I do! It’s that the three different types of happiness I identify in my work — happiness, contentment, and joy — already get an overwhelmingly unbalanced amount of attention. I often say that the happinesses have their own publicist and promotions department, not to mention continual parades and parties given in their honor. The happinesses don’t need any help to be popular! But now that we have an understanding of the purpose, the necessity, and the gifts of the other emotions, it’s time to look at our friend happiness. ACTION REQUIRED: Happiness arises to help you look outward (or forward to the future) with hope and delight. THE INTERNAL STATEMENT: Thank you for this lively celebration! The Taoist classic text, the Tao Te Ching, calls happiness the most dangerous emotion – not in and of itself, but because of the way we behave in relation to it. We chase after happiness, sell our souls for it, and try to cement ourselves into its territory, no matter what else is going on in our lives. This exploitation of happiness jeopardizes us, because when we refuse to pay attention to any emotion except happiness, our emotional landscapes become stagnant and unbalanced – which may make us chase even more furiously after happiness. Consequently, we may spiral into emotional suffering, mental confusion, physical imbalance, and spiritual malaise. By chasing after happiness, we can actually create the most joyless lives imaginable. More to the point, happiness is an emotion that lives inside us, so what are we actually chasing when we chase happiness? Where are we running to (or from), and why? Recent research has also suggested that we’re absolutely terrible at predicting what will make us happy or unhappy; in his 2006 book Happiness: The Science behind Your Smile, psychologist Daniel Nettle explores numerous studies that show humans to be almost clueless about what will actually make them happy. For instance, most of us are certain that money will make us happy, but studies of lottery winners suggest that sudden riches are in fact very shocking and tend not to impact winners’ baseline happiness levels at all. Also, while being poor is certainly detrimental to health and well-being, there is a strong suggestion that, after a modest level of financial comfort is reached (at, say, an annual family income of fifty to sixty thousand in 2007 U.S. dollars), there seems to be very little connection between more money and more happiness. Yet still we chase after money and any number of other pointless things, when happiness actually lives right inside us. It’s interesting to note that many people use the word “unhappy” to describe any troubling emotion – as if happiness were the expected and required state, while anything else merely equaled its opposite. Unhappy is a very lazy weasel word (in fact, I call it a wonder weasel! ), and its use signals a lack of emotional awareness. Does unhappy mean you’re sad, angry, anxious, apathetic, fearful, depressed, ashamed, or what? It’s important to know, because happiness is not the opposite of any emotion (though we’ve certainly been told otherwise!). Happiness is not the opposite of anger, because happiness doesn’t strip you of honor or boundaries. It’s also not the opposite of sadness, because happiness doesn’t strip you of your ability to ground and relax, let go, or rejuvenate yourself. Happiness is not the opposite of fear either, because it doesn’t strip you of your instincts or your ability to take action. Happiness doesn’t exist in some strangely divergent emotional universe; it is an emotion like any other, and it carries its own unique emotional energy that blends and dances beautifully with all of the other emotions. Happiness performs a specific function (it helps you look at the world with hope and delight) – but it can only do this properly if it is treated with respect and allowed to arise in its own way and in its own time. Happiness can be a difficult emotion for many of us to grasp, because it is so often paired with foolishness in some form or fashion (happy fool, blissful ignorance, slaphappy – that sort of thing). But happiness isn’t ignorance or foolishness – happiness holds your sense of wonder and anticipation of good things, and it looks forward to the future. It is in many ways a child’s emotion in our culture, because growing up nearly always requires the growing away from happiness and ease. In response to this crackdown on happiness, we’re surrounded by many books and seminars that tell us how to play, how to find work we love, how to bring money to ourselves in fun ways, and so forth. Though these books often sell, their messages tend to remain on the margins, because there seems to be a powerful belief that only children are happy, while adults are serious and hardworking. The flaw in this argument against happiness is this: Children are actually very serious and hardworking – in addition to being happy and playful! If you’ve ever built a fort with a group of eight-year-olds, or helped a child with a particularly daunting piece of homework, you’ll have seen a work ethic that can far exceed an adult’s. Children have an exquisite ability to focus themselves on huge problems and projects, yet not feel crushed, and I think that’s because they have the permission to be happy, and to play. Being allowed to laugh, clown, fool around, and play actually allows children to flow into and out of struggles, and to continually replenish and resource themselves by moving fluidly between work and play. Play, comedy, and happiness contribute fluidity and agility to each one of us – and they shouldn’t be relegated only to the world of childhood. We all require a great deal of play and silliness to balance our intensity and seriousness if we want to accomplish anything worthwhile. If you’ve been convinced that happiness is the wrong emotion to feel in the dire atmosphere of the present day, just sit with that idea for a moment, and ask yourself – could our current epidemic of familial decay, social upheaval, emotional disorders, and political impotence have anything whatever to do with the fact that adults are expected to work like draft horses, yet aren’t allowed to be silly and hopeful and happy? If you look to the future, do you see grim death, disaster, and global warming – about which you can do precisely nothing? Well, that’s very adult of you. But can you get into a playful state where you imagine us turning this giant behemoth of a society around, so that it serves us, instead of us serving it? Can you see it in your wildest dreams? Because you used to, every day – remember? I remember, as a child, looking at world hunger and creating hundreds of solutions for it. Sending my lima beans to China was just one facet of a multi-tiered plan of action. Do you remember your own world-saving plans? Because each of us came into this life with all the vitality and brilliance we need to save the world; many of us have just forgotten how to access it. I notice that people who live their dreams and save the world one heart at a time are able to do so because they give themselves permission to be happy, even slaphappy, while allowing equal time for the adult view, the depression, and the truth of the degradation all around us. These people find an intense problem, and then throw themselves at it full-on – like it’s a game of Red Rover – with their entire emotional arsenal. This is so different from people who scrabble after happiness without the balance of serious introspection and hard work; or from people who press toward endless work without the balancing influence of play, laughter, silliness, or a willingness to look ridiculously hopeful while working for a different future. Such happy-chasers and hyper-serious people can’t seem to get out of their own way, which means they aren’t particularly effective as workers, dreamers, or agents of change. If you can allow yourself to flow between work and play, between seriousness and goofiness, and between honest hope and honest despair – if you can bring your full-bodied self to any task – your happiness will arise not because you repress all of your other emotions, but because you live a full, 360-degree emotional life. Happiness isn’t foolish; it’s an emotion with an important job to do. Get out of its way, and let happiness do its job! Here’s a fun fact about happiness: A 2008 study by Harvard medical sociologist Nicholas Christakis and political scientist James Fowler suggested that happiness is actually contagious in social networks, and that it seems to travel more effectively than unhappiness (yes, unhappiness is weasel word, but we know what they mean). Basically, if you have a happy friend, or even a friend of a friend, your chances of feeling happiness increase; therefore, it’s important to be aware of the emotions you share with others. Smiling, laughing, goofing, and friendliness are behaviors we can share when we feel them, and in so doing, we may increase the happiness of others. Keep one caveat in mind when you use humor, however: Watch out for sarcasm; as we’ve all learned online and through misunderstood e-mails, sarcasm can look and feel exactly like anger (which is usually what it is). As you look at your behavior on social media, check in with the emotions and the emotional tone you share. If you’re constantly posting or commenting about injustice, outrages, complaints, or tragedies, check in with yourself: What is your current relationship to happiness, and how are you affecting your social networks? All emotions have their time and place in a healthy life; does happiness have any place in yours, and if not, why not? If you want more happiness in your life, look closely at the stories you tell yourself. Whether you glorify happiness or shun it as frivolous, you can bring balance to the situation by bringing your relationship to happiness out in the open, placing it on a contract, and releasing yourself and your happiness from any unfulfilling stories you’ve created. When you can allow your happiness to flow as but one of your many emotions, it will begin to arise naturally (and playfully) as it helps you restore full-bodied flow to your emotional realm. Your task, when happiness arises naturally, is to laugh, goof, smile, and dream (Thank you for this lively celebration!) – and then to flow into your next task or your next emotion. If you try to imprison your happiness, you’ll spiral into a forced kind of gaiety that might destabilize your emotional realm and increase your tendency toward depression. The key to working with happiness (or any emotion) healthfully is to see it as a momentary passage and not a final destination. Interestingly, if you give your happiness complete freedom, and welcome whichever emotions you feel before and after it arises, your happiness will tend to arise more often, and in response to more and different stimuli. The key then, when your happiness flows more freely, is to continue to let it flow – instead of showcasing it as proof of your emotional mastery. Flow is the key! Remember to welcome your happiness on its timetable – not yours. Learn to work with happiness instead of chasing it down or slapping it away. Welcome, honor, and thank your happiness. Then let it go. Happiness is not a reward, and it’s not a sign of foolishness; it’s an emotion, and it has specific work to do. Enjoy your happiness, thank it, and let it go – it will return when it’s time to feel amusement and delight, or when it’s time to look forward to the future with hope and wonder! Dear Karla, I just rec’d your new book on The Art of Empathy, and I was like a child at Christmas, saving it for a perfect moment to begin reading it. Thank you for perseverance this summer as it was a real tough one for me. Maureen — you got it already? How exciting! I’m so glad you made it through this summer, and I hope the book supports you. Thank you for letting me know you’ve received it!